I cut the door portion from the Thick Very Vanilla panel and set the door aside. I then ran the top half with the missing door through the Big Shot using the Brick Wall embossing folder. I added Cajun Craze ink to the bricks with a Stampin’ Sponge, I then went over it again with the Smoky Slate ink and a Stampin’ Sponge. I really love how it turned out. What about you? What would you change when you make it yours? I decided to keep the garland even though they’re holly berries because when I colored them in they look very fall-esque. Of course the sunflowers and pumpkins fit perfectly! I think dimensionals give so much life to a card, so I kinda went crazy with them here. I added all the ink into the flowers etc. using the Blender Pens because they give much better control and hues on smaller pieces in my opinion. I used Pumpkin Pie & Tangerine Tango inks for the pumpkins, Garden Green for the stems and flowerstems. I used Pumpkin Pie, So Saffron, Real Red & Smoky Slate inks for the flowers. I used Smoky Slate and a touch of Dapper Denim for the door, and Crushed Curry for the handle. I used Pumpkin Pie, Real Red, Garden Green, So Saffron & Cajun Crake inks for the garland. I used Pear Pizzazz, So Saffron, Real Red, Soft Sky & Smoky Slate inks for the lights. The mat is stamped in Archival Black ink onto Crumb Cake card stock. I hope you have enjoyed this creation as much as I loved creating it! Be sure to follow all the way through the hop, so you have 11 chances to enter to win a super prize. You need to leave your FIRST and LAST name, a comment & #STAMPITCONTEST to be entered to win! Is this where I enter the contest? #stampitcontest Love your fall card, very pretty. Not sure my comment went through earlier. This card is super cute! Love the fall scene you created and the coloring! Thanks for sharing this awesome inspiration project! Sweet card for the holidays and so warming as if to say come on in. Love that door! 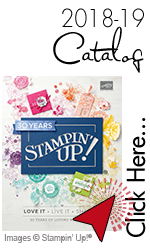 One of my favorite stamp sets! Love the details on your beautiful card! Oh no Maggie! I’m so sorry. If you’re a demo, call DS and they’ll help you out, if you’re not I’d be happy to send you a happy Crafty package to make you smile when you’re ready to get crafting again.